temperatures in the root zone moderated which means less stress on plants! Apply a 2-4" layer of the mulch of your choice. Do not pack mulch up around the stems of plants as this can cause stem rot which can kill the plant. 2. LESS FREQUENT BUT DEEP WATERING: Trees and shrubs that have been in the ground for more than two years only need watering during extended dry spells. Water early in the morning (ideal) or at night so that less water is lost during the heat of the day. Deep watering encourages roots to go deeper into the soil where water is retained longer. 3. 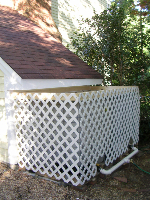 CATCH RAINWATER: Rainbarrels can be joined together in order to catch more water. 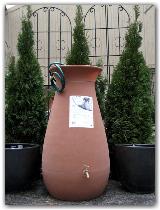 Homewood has 3 styles of rain barrel to choose from. Cisterns are much larger and these can be installed both above and below ground to capture hundreds to thousands of gallons of water. Larger in-ground tank systems can be hooked up to existing irrigation systems and to hoses as well. More information on that to come...In the meantime, there are links below for large rainwatercapture systems. 4. REDUCE THE LAWN: Making lawn areas smaller and replacing them with drought tolerant plants, hardscape, or "natural" areas. rootball where plants need it, and allows you to monitor plants more closely to determine their water needs more accurately. 6. PLANT IN EARLY SPRING OR FALL: It's harder for plants to establish in the heat of summer and it's harder to keep them watered then, so plant in the cool months to help your plants establish more easily and with lower water requirements. 7. 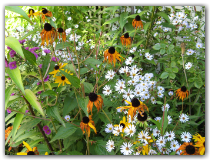 PLANT DROUGHT TOLERANT PLANTS: Check out the links below for plant lists and remember that even drought tolerant plants need to be watered regularly the first year in the garden. 8. PRUNE: Thin out old tangled branches on trees and shrubs and remove uneven lateral growth. This reduces the plants' need for water. 9. USE WATER-HOLDING GRANULES AND MATS: Available as granules to mix into potting soils, mats to place in the bottom of pots, or already mixed into specially formulated potting mixes, these water holding products expand to many times their size to hold extra water around root zones. These are excellent for container gardens and hanging baskets! availability in garden centers. REMEMBER, DROUGHT TOLERANT PLANTS MUST BE WATERED REGULARLY THROUGH THE FIRST SEASON. that flower all summer. Butterfly attractor. 2. Autumn Sage (Salvia greggii) - Flowers all summer. Tough. Attracts hummingbirds & butterflies. fall/winter berries, and red or burgundy winter foliage. lavender flowers in late spring and summer. with bright jewel-toned flowers and fleshy leaves. daisy-like flowers with brown central cones in summer. colorful flowering season in mid to late summer. spikes of colorful summer blooms that attract butterflies. Want to capture rainwater for your garden on the cheap? valves come with the tank. A hose can be attached to the spigot and if more water pressure is needed a pump can be screwed on to the spigot and the hose attached to it. A plywood wooden frame was built over the tops of the tank with holes cut in for the water to enter the tanks. Mesh screen covers the holes to keep mosquitoes out. A 6" PVC pipe connects the tanks to the holes in the plywood cover. To pretty it up, Mr. W. attached lattice to the frame. Holes are drilled into the 2x4's of the frame so that overflow can spill out.